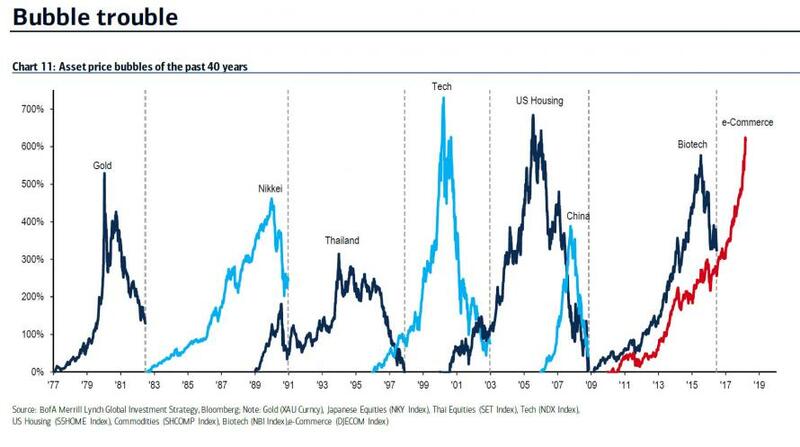 At the end of March, we showed that according to Bank of America, we are now witnessing the third biggest bubble in history created by a central bank. 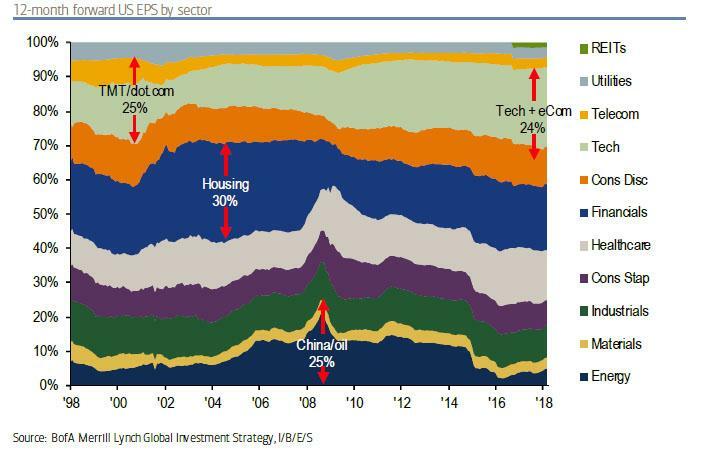 As bank CIO Michael Hartnett wrote, "the lowest interest rates in 5,000 years have guaranteed a melt-up trade in risk assets", which Hartnett has called the Icarus Trade since late 2015, and points out that the latest, "e-Commerce" bubble, which consists of AMZN, NFLX, GOOG, TWTR, EBAY, FB, is up 617% since the financial crisis, making it the 3rd largest bubble of the past 40 years, and at this rate - assuming no major drop in the 6 constituent stocks - the e-Commerce bubble is set to become the largest bubble of all time over the next few months." Hartnett then went on list 10 specific reasons why BofA is now advising clients to sell tech stocks (reported below), but the single one, most pressing concern was the threat of regulation, especially in the aftermath of the Facebook Cambridge Analytics fiasco and last week's congressional hearings. Which brings us to the latest "Weekly Kickstart" report by Goldman's David Kostin, in which the Goldman strategist writes that - just like Citi earlier - "recent weakening in some indicators have prompted clients to question how long the current expansion will last" to which he responds optimistically, pointing out that Goldman economists forecast US GDP of 2.8%, 2.2%, and 1.5% in 2018, 2019, and 2020. Nevertheless - he adds - "a skeptical buy-side community focuses on downside risks." 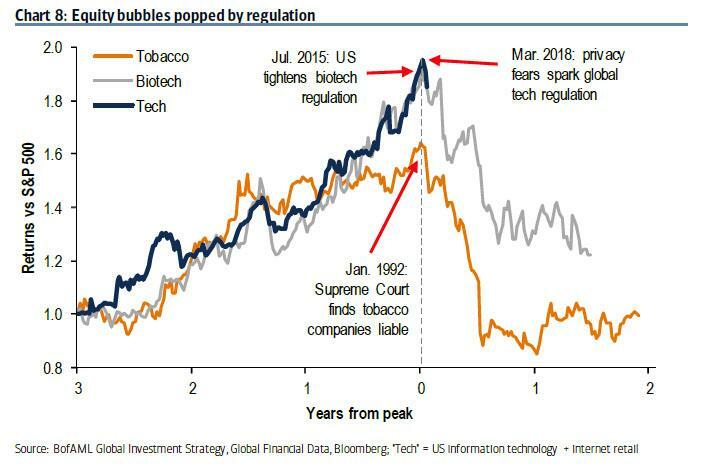 Meanwhile, as Zuckerberg was testfying in DC, Goldman's equity research analysts hosted discussions with policy experts regarding Technology regulations. Their conclusion: while comprehensive data privacy legislation in the US is viewed as unlikely this year, investors should expect regulation through other channels, such as State Attorneys General or self-regulation. 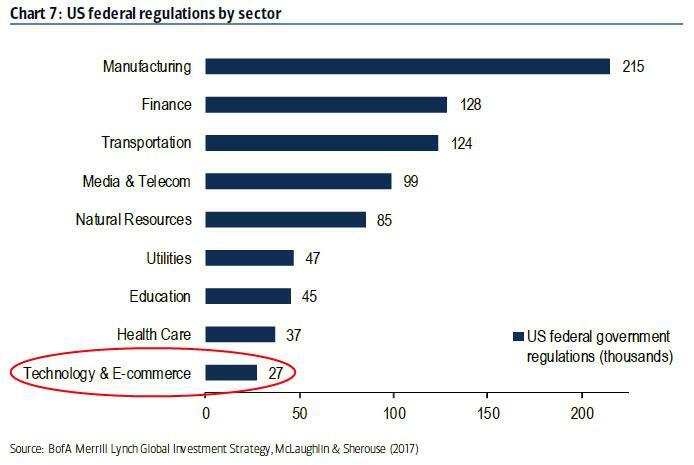 However, in addition to a useful metric for Congress on how to think about Facebook, the upcoming constituent re-classification in the S&P "represents the second major risk to the Tech sector" according to Goldman. Some history: "in September, the major index providers MSCI and Standard & Poor’s will re-categorize components of the global equity markets. 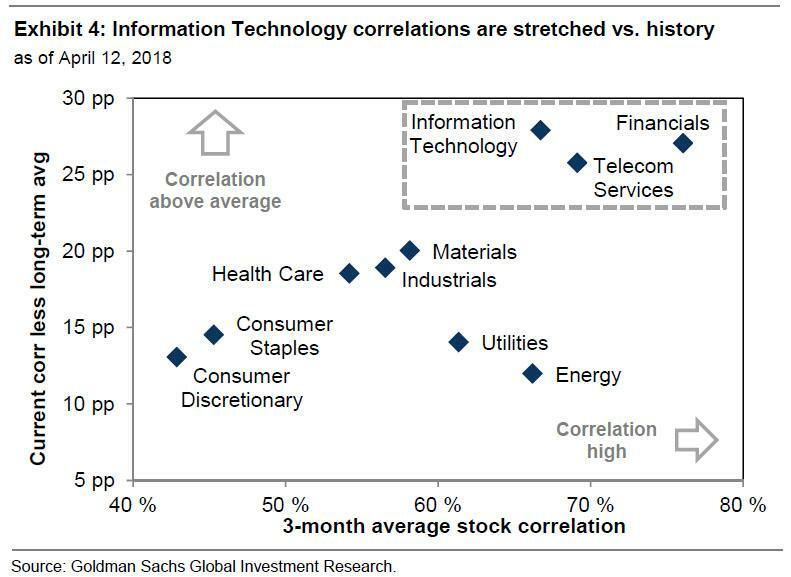 Using the S&P 500 index as an example, five current constituents (GOOGL, FB, EA, ATVI, TTWO) comprising nearly 20% of the existing Information Technology sector will be re-classified into Communication Services. Following the reclassification, the Information Technology sector weight in the S&P 500 will decline to 20% from 25%." 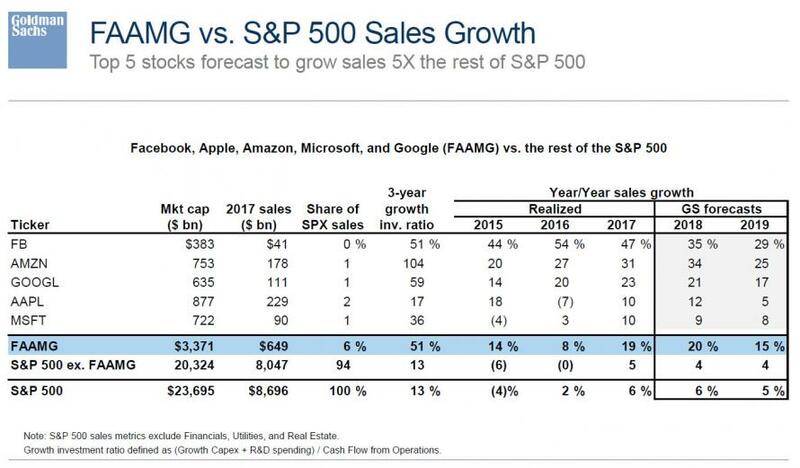 The implications: "with two of the largest and fastest-growing companies transitioning out of Information Technology, the sector will lose some of its appeal to growth investors. 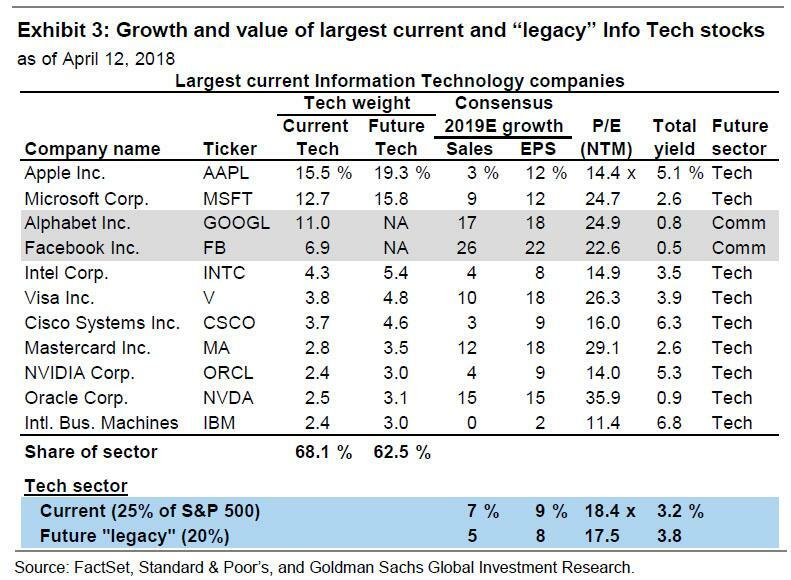 The future “legacy” Tech (i.e., firms remaining in the sector) will have much slower expected sales and earnings growth and lower margins than both the current Tech sector and the new Communication Services sector, which will also include Telecom and select Consumer Discretionary stocks (DIS, NFLX, and others)."